While often a sensitive subject, estate planning is one of the most important things you can do, ensuring proper measures are put in place upon your death. Having a proper Will ensures that your loved ones will be taken care of and your assets properly dealt with according to your wishes. We will help provide security and peace of mind for yourself and your loved ones by walking you through the steps and ensuring all angles are covered. We will guide you in assigning the appropriate executors, attorneys and directors, and assist you in ensuring your Will is valid and complete. 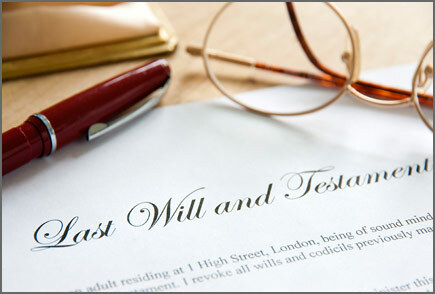 While it may be tempting to avoid fees and create your own Will, there are certain disadvantages to doing so, which includes such possibilities as not clearly stating your intentions to a legal satisfaction, your original documents not being discovered upon your death, or the possibility of original documents being destroyed by disgruntled beneficiaries. Working with us, we Will ensure that your Will is legally whole and complete, stored properly and safely, and that your wishes are carried out with minimum expense or delay in the event of your passing. You should occasionally update your Will, particularly if your circumstances have changed. Scenarios that may justify the updating of a Will include marriage, separation, birth of a child or children, or the death of a sole executor or sole beneficiary. We will be available to advise and review any changes to your Will with the changes in your life so you can always have peace of mind that your affairs are in order. Enduring power of attorney – This document appoints an attorney to make financial and asset – related decisions for you should you lose your mental capacity. Should you not have someone appointed legally, it becomes the public guardians’ responsibility to appoint someone for you. This can be a lengthy and costly process. Personal Directives – This document appoints a director to make decisions about your health and wellness in the event of lost mental capacity, and also includes a “living will” component. Again, should you not have someone appointed legally, it becomes the public trustee’s responsibility to appoint someone for you.